Hello BSB Beauties! I have so much to share I just do not know where to start. Well, I was on vacation recently in Asheville, NC. Yes, Asheville, NC! It is such a cute city and I had the best time. Anyway, I was shopping in the Grove Arcade when I came across this cute little makeup boutique/studio called Makeup at the Grove Arcade. I immediately took a B-line straight into the store and I loved what I saw. To be a small store, what they had to offer packed a powerful punch. Owner and Makeup Artist Scott Thompson greeted me immediately. He was so kind and knowledgeable about his products and makeup artistry in general. He had the cutest style and I just loved is bowtie. :-) I could have spent all day just chatting with him. You have to visit the store if you are ever in Asheville, NC. Well, while we were chatting and I was trying different products, I spotted the most vibrant neon fuchsia eyeshadow and the conversation just STOPPED! I took that excited deep inhale and grabbed it. I knew before I even tried it on, if it looked as good on as it did in the container, it was Mine! It was a makeup line that I had never heard of called Ben Nye. They are mostly know for their theatrical and effects makeup, but they have products that can be used in your everyday makeup kit. 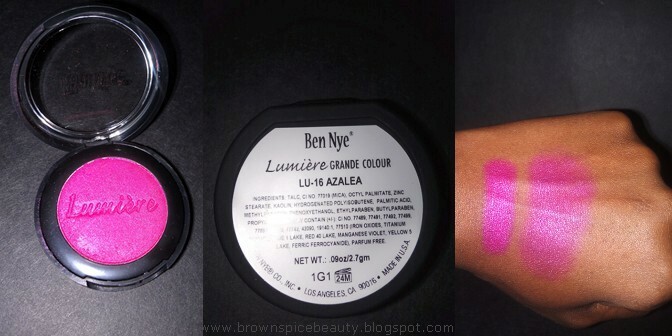 The shadow I grabbed is from the Ben Nye Lumiere Grande Colour line in the color LU-16 AZALEA. For only $10 you are getting .09oz of shadow, which is huge for the money. It is almost the size of a blush, that is how much product you get. Ben Nye describes this product as having Extreme color power and enticing shimmer and can be applied dry to a softer finish, or with water for enhanced opacity. Color swatch was done with No Primer and shows a heavy and a more blended out application. I decided to try this shadow out at a fashion event I recently attended. My look for the event called for a highly pigmented color in a more creamy consistency. I used a lid primer and made the shadow creamy by simply adding a few eye drops to some of the shadow that I scraped off and blended it together on a pallet. Here is the result! I have to say, this shadow's pigment is AMAZEBALLS! It took very little to get that bright fuchsia neon color you see in the pictures. It lasted through the entire event, which some of it was outside in the sun, a stroll in the city and dinner. I actually took these pics at the end of the night. Pigmentation: Amazing! Very little needed to achieve color in container. Value: You get a lot of product at a very low price. Long Wear: Yes Ma'am! After all day wear with sun exposure and humidity, color stayed true. Look for us to review more Ben Nye products very very soon.